One of Queensland's largest cities, Townsville is a military town and appropriately houses the Army Museum of North Queensland. 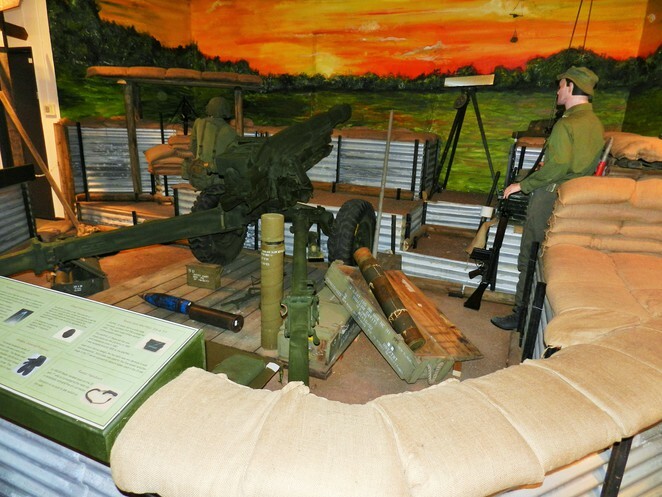 The museum, set in parklands at Jezzine Barracks is at Kissing Point, an area steeped in military history. A fort was built at Kissing Point in the 1890's. 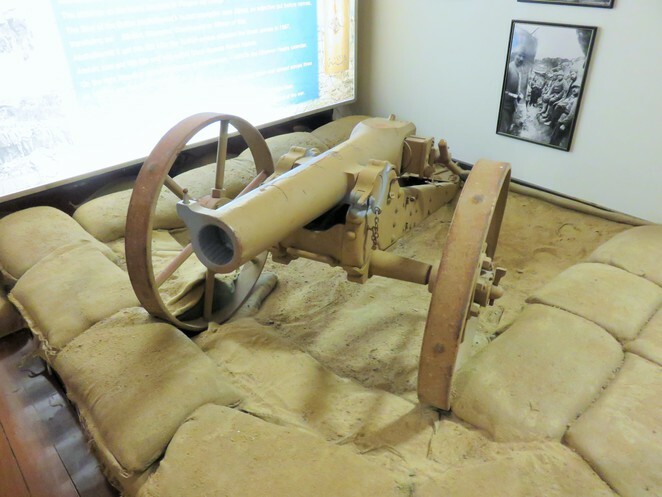 A 1898 Turkish mountain gun used at Gallipoli. The museum which opens free to the public is staffed by volunteers and army personnel. Those we spoke to were ex-military and their personal stories and insights were as interesting as the exhibits. Three galleries represent different phases of Australian military history; the late 1800's to the end of the Boer War, World Wars I and II, and post-World War II. Exhibits include artefacts, medals and personal military histories, machinery, weapons, film footage and documentaries. WWI trench and Western Front Tunnel interactive display. 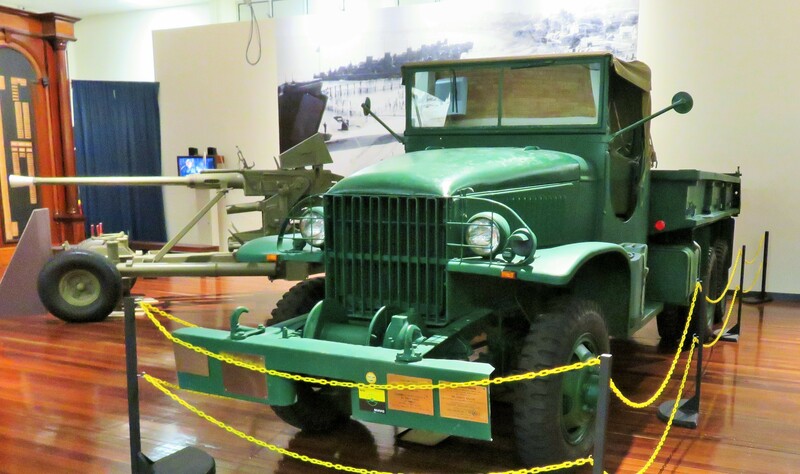 Not just the realm of military buffs, the museum is a well ordered and items are of general and historical interest. Children are welcomed and encouraged. Volunteers are present in the galleries and are eager to help, to explain, to reminisce, and to guide. Location: The Museum is located in the Jezzine Barracks Precinct at Kissing Point, Jezzine Barracks, 1 Mitchell St, North Ward. Contact: Telephone (07) 4721 1495, by email army_museum_nq@bigpond.com or via their website. Facilities: The Jezzine Barracks Precinct includes parking, toilets including disabled facilities, wheelchair access (limited access to some areas), picnic shelters, a barbeque area, an observation deck, and a coastal walkway from The Strand to Rowes Bay. The first gallery recounts colonial times through to the Boer War. Wall mounted information boards detail the history of the Army with a particular emphasis on North Queensland. Guns were first installed at Kissing Point in 1885 and volunteer forces commenced training here in the following year. Rare photos of these early operations are reproduced and annotated in Gallery 1. The Army operated in this area until 2006, when the move to the Lavarack Barracks was completed. 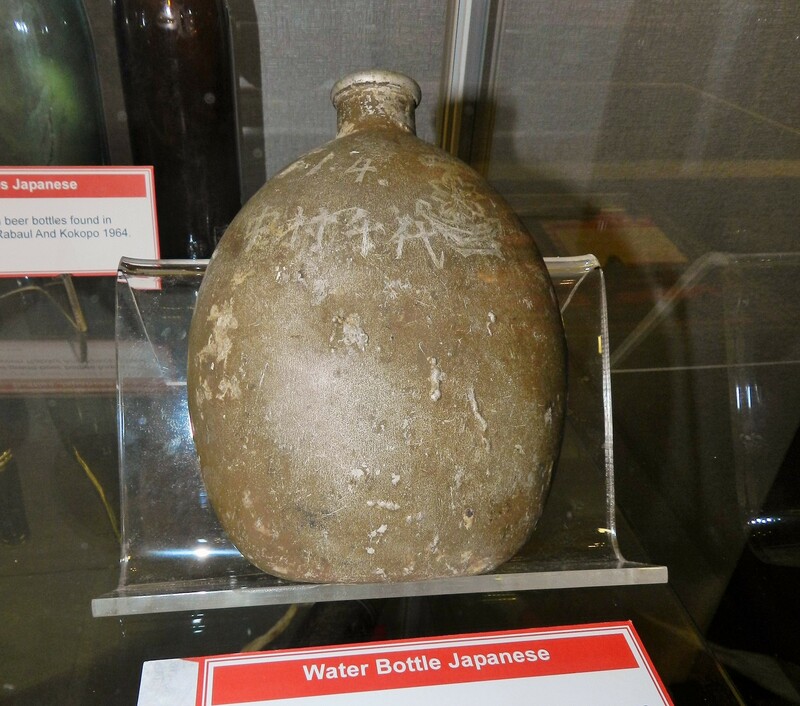 A WWII Japanese water bottle (Dislplayed in Gallery 2). 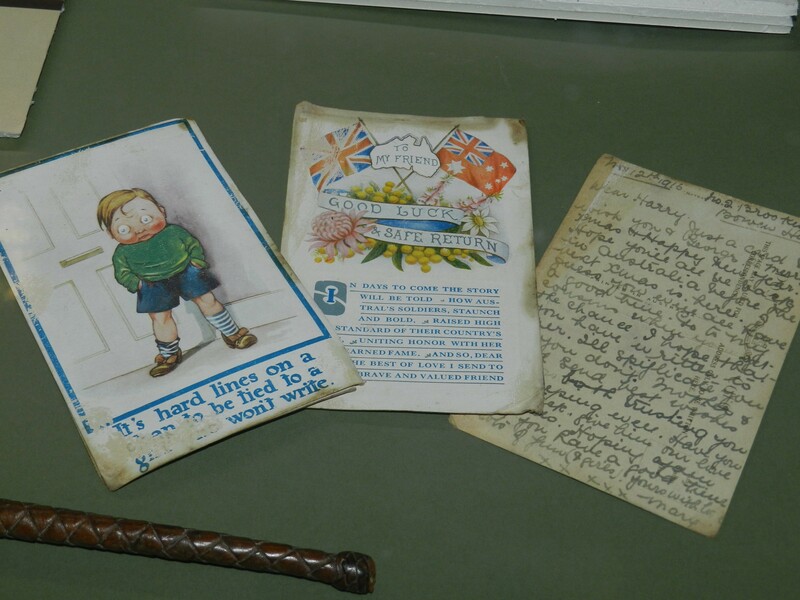 Glass display cases exhibit artefacts including swords and bayonets, handcuffs, bullet belts, and a soldier's diary. We pause to read the diary. In a corner a Colonial Officer's tent is recreated, in which the gentlemen in partial uniform is attending to his morning shave. 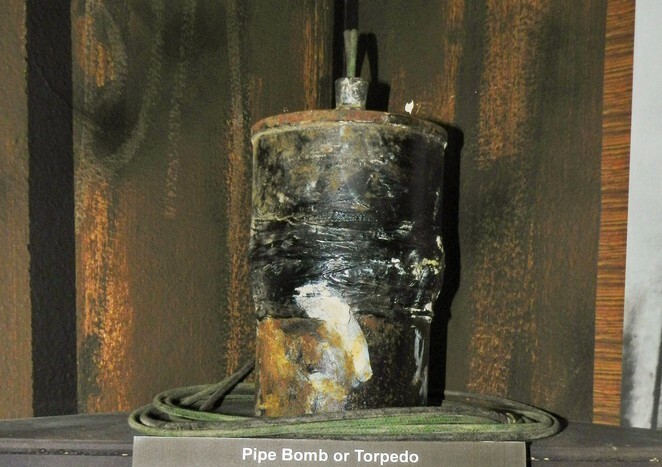 A pipe-bomb used by Australian tunnellers on the Western Front (Displayed in Gallery 2). A Nordenfelt 10 Barrel Gun reminds us how long ago serious weaponry was developed. Designed in Sweden this gun was patented in 1873 and was demonstrated as firing 3,000 rounds of ammunition (rifle calibre cartridges) in 3 minutes and 3 seconds. World Wars I and II are commemorated in Gallery 2. 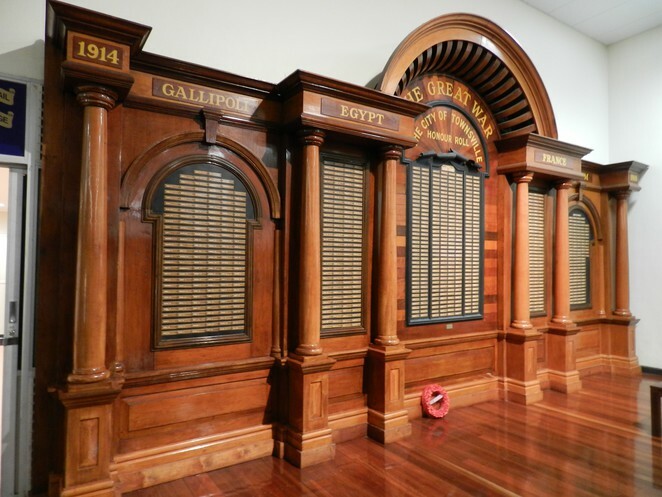 Most noticeable as we enter is Townsville's WWI honour roll displayed on magnificent polished boards. The boards which were previously housed in the RSL and had to be restored after being damaged by fire, occupy an entire wall. The overwhelming list of names, this area's loss to the Great War, is testimony to the human tragedy. Townsville area WWI hnour roll. A documentary plays on a small TV set and for a while we sit in silence and watch. There is something about this hall that commands a reverence. It does not glorify war, rather it mourns for and honours those who have given of themselves. Artefacts include a typewriter in a metal case brought home from Gallipoli. Silk handkerchiefs bought as souvenirs by soldiers serving on the Western Front are framed under glass. A darkened room is set up with interactive WWI trench and Western Front Tunnels. 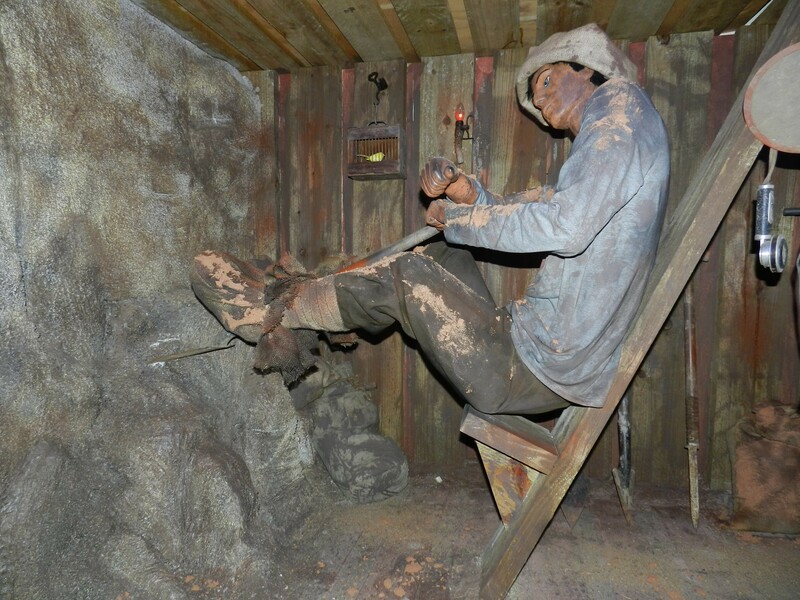 Life size models demonstrate how tunnels were dug. We learn about the periscope rifle, invented by an Australian soldier in 1915 for the Gallipoli campaign and we look through trench periscopes. As we move through the hall, WWII becomes the subject of the displays. Alongside Australian artefacts, German, Russian and Japanese items form part of this collection. Cases of weaponry include the 1939 Australian designed Owen Gun, a Thompson Sub-machine Gun, Russian and German grenades, and a variety of hand guns. 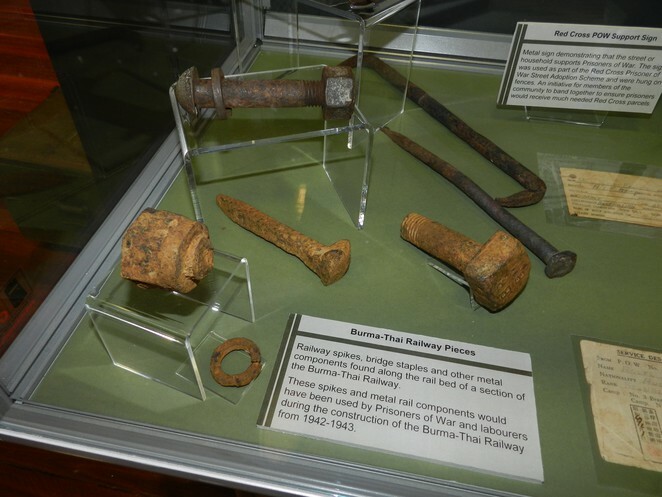 Rusted Burma-Thai railroad spikes, a Japanese water bottle, a Japanese helmet, a 1942 rice bowl from Changi, a life-size recreation of an emaciated prisoner, and a tribute to Weary Dunlop are but a few of a series of exhibits dedicated to prisoners of war. Spikes and rail components used by prisoners constructing the Burma-Thai railway. 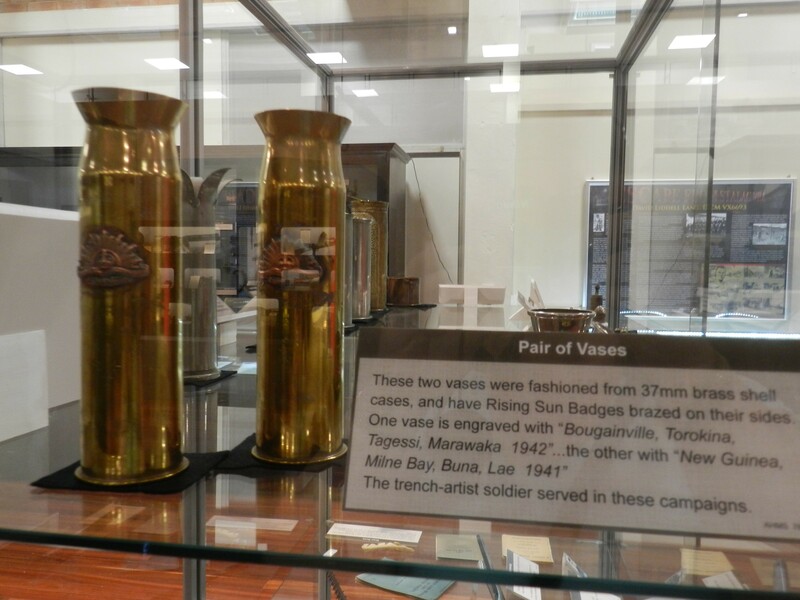 There are some outstanding examples of trench art; shell cases turned into vases with elaborate engraved designs, letter openers and cigarette lighters. I am reminded of two spent shell vases that graced my grandparents' mantelpiece. They lived through both these wars and the museum gives us a greater appreciation of their times. At the end of the room is Townsville's WWII honour roll. There are too many names on the boards, each one an individual gone too soon. Again we sit in the shadow of the boards and watch a documentary. An old army truck is displayed alongside a 40mm Bofors Gun, a medium weight anti-aircraft gun. My husband has a keen interest in the wireless sets. I am drawn to war time postcards, banners and cameras. We follow blue painted footprints to the final gallery and we stop to put our heads in cartoon like army personnel cutouts. Fun photos for our collection. Gallery 3 is dedicated to post 1945 conflicts including Korea and Vietnam. A Korean war operations station, a tin and board shack, has been recreated. There is a wireless set on a desk and a kettle sits atop a stove which appears to be made from a metal drum. 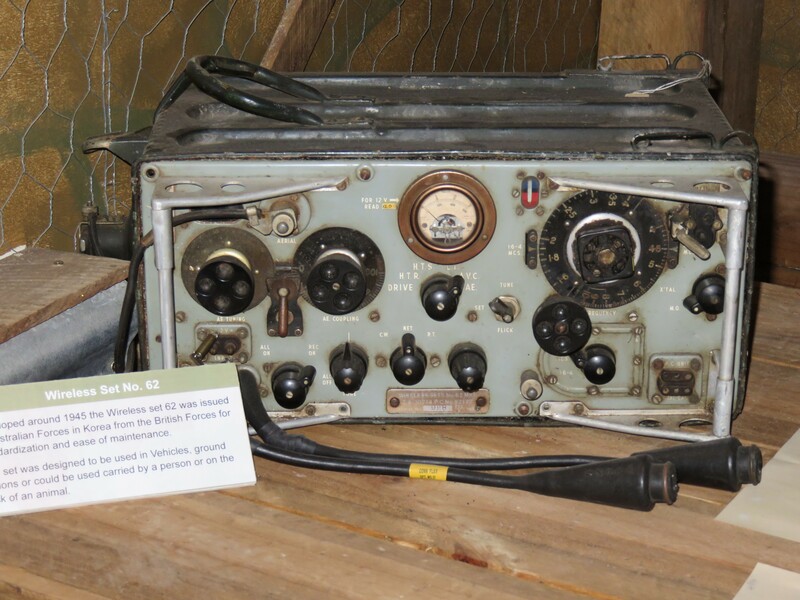 A wireless set used in the Korean War. While we watch Vietnam war footage set to music of the times we chat with one of the volunteer staff. Army boots are discussed at length. No longer are military men required to shine their boots. Patent leather parade boots were issued but these were made in China and the glue on the soles and the pins in the heels gave way. In 2013 R M Williams secured the contract to provide the boots. Viet Cong artefacts have a place here too, including a pair of 'Ho Chi Minh Sandals,' a practical alternative to boots. The rubber soles of the sandals were made from tyres and the straps from the inner tubes. 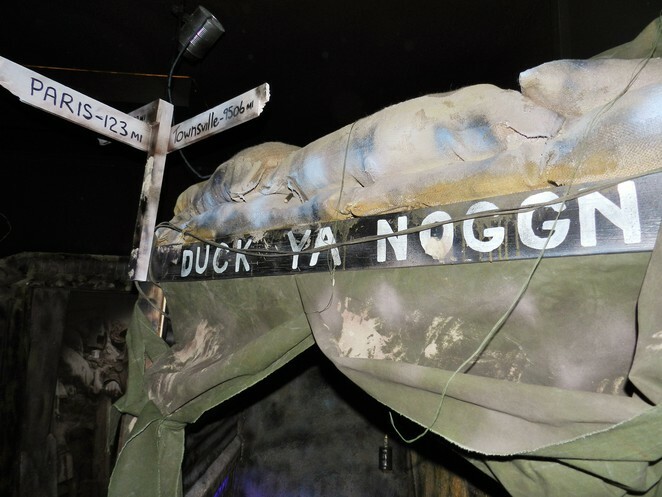 A Vietnam fire support post (protected gun placement) has been recreated behind sandbags at one end of the hall, the gun pointing to a full wall panorama of the war landscape. A Vietnam fire support post. Lavarack Barracks is the Townsville home of the Army's 3rd Brigade and 11th Brigade and its story is told here. The barracks are named in honour of Lieutenant General Sir John Lavarack, an Army officer during both World Wars and later the Governor of Queensland. We drove past the barracks on our way into Townsville and were struck by the enormity of the complex. Why? To view this remarkable collection of war memorabilia, to learn, to appreciate and to honour the men and women who have served for their countrymen. When: Wednesday 9 am to 1 pm, Friday 9 am to 1 pm, Sunday 9 am to 1 pm. Anzac Day 11 am to 2 pm. Closed Christmas Vacation and Good Friday. Cost: Admission is free but donations are appreciated. Great Photos and great content! Wow! You did the museum proud with this article. They will respect Thi. What's on in Winton 2019?